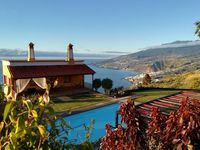 Properties in Isla de la Palma average 4.6 out of 5 stars. Property 7: Villa Taburiente, modern, breathtaking views, nature and good weather. Property 10: Modern house with private pool, sea views, free WiFi, barbecue, air conditioning. Property 11: Characterful villa with large Private heated pool and Panaromic Views. 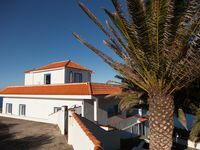 Property 12: Top Villa in Top Location! Property 16: Villa with three bedrooms and two bathrooms with three independent living rooms. Property 17: Fantastic property for nature loves and those seeking peace! Property 22: Villa Mary, family resort where to disconnect from everyday life. Pura Vida - longing for rest and relaxation in your active holiday? Property 23: Pura Vida - longing for rest and relaxation in your active holiday? Unique villa with stunning 180 ° sea views. Spectacular pool terrace. Property 27: Unique villa with stunning 180 ° sea views. Spectacular pool terrace.